Providing you the best range of trodat stamp printy 4913 and trodat stamp printy dater 4750 with effective & timely delivery. We are offering Trodat Stamp Printy 4913. It is a self-inking stamp and can give upto 10000 impressions. Used mainly for short and crisp matter. Design, colour, size, shape can be customised as per your requirement. 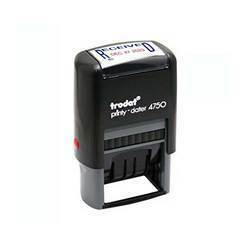 We are offering Trodat Stamp Printy Dater 4750.